If God's people live with a proper sense of urgency and passion before the lost world, they are going to grow weary. They will grow weary physically. They will grow weary spiritually. They will grow weary of all the demands placed upon them. Jesus frequently got away from the crowds, or at least tried to get away from them for a time, and he spent time with his disciples. Some of that time was for rest. Some of that time was for teaching. Some of that time was for prayer. 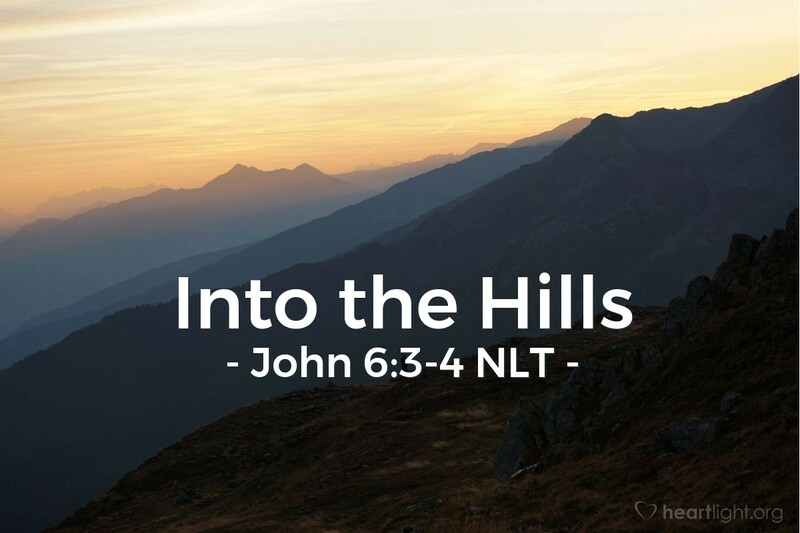 We must realize that we all need some "into the hills" time where we can be in Jesus' presence, learn from him, rest in his grace, and speak with him without being in a hurry and without the urgency of pressing demands. How are you doing with your "into the hills" time? A short email or online devotional fits our harried lifestyles and can sustain us for a time, but we all have to have some prolonged "into the hills" time. Set aside some time each day to be in the Father's presence and go "into the hills" with Jesus! O my, dear Father, I often lose track of how busy I let myself get. It seems that I try to cram my time with you into the few quiet moments I can find. Please open up some time for me in my schedule to spend some unhurried and concentrated time with you. Tug my heart so that I yearn for that time. Give me the conviction not to let other things deter or distract me. I confess that I cannot make it without your presence and power in my life. Draw me close, O LORD. In Jesus' name, I ask this. Amen.